Wow. Have times ever changed over the years. Now, being tall doesn't mean having to wear funny looking clothing, and we have the merchants to prove it. We've assembled an excellent selection of the top online tall mens clothing stores. The styles and fashions you want are now online. The following merchants offer an excellent selection of tall mens clothing. For a complete list of all of our tall mens clothing departments, please click on the Sitemap link at the top of the page. Now you can shop online for tall mens clothing with one of the leading Internet retailers. Zappos features name brand tall mens shirts, shorts, tall polo shirts, and extra long tee shirts Plus -- Zappos offers free shipping and free return shipping, so you can order as many items as you wish, and keep only the ones you like. 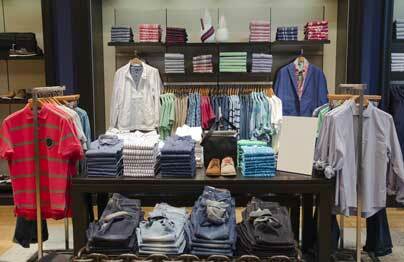 Now you can look your best, even if you are tall, with tall mens apparel from Banana Republic. Nearly all mens clothing is available in tall sizes, so there is no "Tall" section on their website. Nordstrom offers a high quality line of tall jackets, coats, pants, jeans, dress shirts, sport shirts, shorts, tall sweaters, tall sweatshirts, and much more. See the Big & Tall section in the Mens Shop. Complete selection of tall mens clothing online. And, shipping is Free with orders of $50 or more. For name brand fashions in mens tall sizes, Macy's is the website to visit. Fashionable tall mens apparel, including mens tall sizes in sweaters, shirts, jeans, polos, tees, and more. Penney has an excellent selection of extra long clothing for tall men. This UK retailer has a great selection of tall mens clothing - be sure to use the "Load More" button at the bottom of the page. Free shipping over $49.99 and free return shipping for U.S. customers - see "Delivery & Returns" page. Don't miss this one!